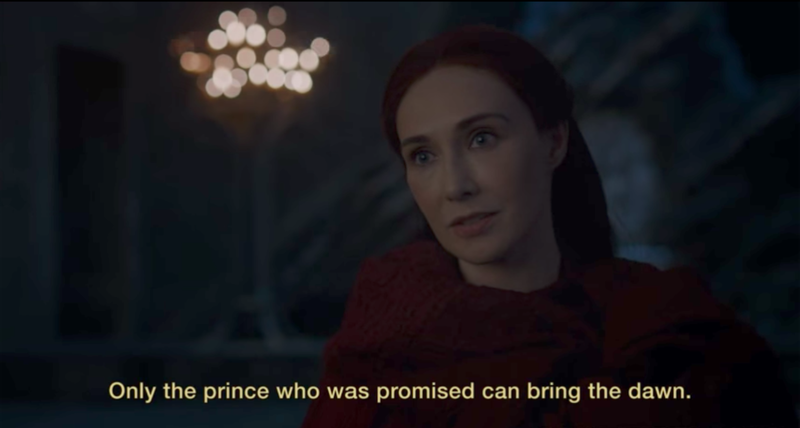 In last week’s episode of Game of Thrones (7.2), the priestess Melisandre reiterated a prophecy about “The Prince That Was Promised,” applying it to Daenerys Targaryen. The books and the TV series have mentioned this prophecy before, in relation to Stannis Baratheon and Jon Snow, but the scene early in 7.2 with Melisandre, Daenerys, Missandei, and Tyrion Lannister bears a particularly strong resemblance to the political use of prophecy in actual medieval Britain. Political prophecy was a vast literary and cultural enterprise in early Britain, from the 12th century all the way to the 17th. Prophecy guided monarchs and landed people in jail. The Game of Thrones scene captures many of its distinctive features. First of all, the prophecy in 7.2 exists as an authoritative (written?) text to be quoted. Melisandre is not announcing the prophecy in real time but repeating a disembodied historical claim charged with faith in the Lord of Light. This is precisely how medieval British prophecy worked. The texts of prophecies are littered with tags like “according to Merlin,” “as Thomas of Erceldoune tells,” etc. In one 15th-century alliterative verse prophecy, the Vision of William Banastre, the title character retrieves information about the future of British politics through an interview with God. The scene also dramatizes the language politics of prophecy. Melisandre delivers the prophecy in High Valyrian, a learned language enjoying similar cultural prestige to Latin in early Europe. Significantly, the conversation between Melisandre and Daenerys is conducted bilingually, in English and Valyrian. Medieval British prophecy took off in the 12th century with the publication of a lengthy Latin prose work, Geoffrey of Monmouth’s History of the Kings of Britain. Geoffrey’s book served as a textual authority for all subsequent prophecy down to the 17th century. In addition to depicting multiple languages, the scene in 7.2 makes an issue of the translation of prophecy. Missandei points out that the High Valyrian word that Daenerys translates as “prince” has no gender and could refer to a prince or a princess. Actual British political prophecy was always in transition between languages. Geoffrey mentions that he translated his book from “a very old book in the British tongue.” Though probably just a rhetorical flourish, this claim shows the power of translation to generate prophetic discourse. Before and after Geoffrey, prophecy existed in and between Welsh, Latin, Anglo-Norman/French, English, and Scots. For instance, an English prophecy called the First Scottish Prophecy was translated into Latin soon after it was composed in the middle of the 15th century. This was the opposite of the usual direction of translation. The same prophecy was also translated into Welsh. Multiple surviving books of English and Welsh medieval prophecy were produced in Wales, not England. Texts were constantly crossing linguistic and political lines. Tyrion remarks that the gender-neutral translation “doesn’t really roll off the tongue,” to which Daenerys responds, “No, but I like it better.” This heavy-handed dialogue illustrates the political expediency of prophecy, its ability to refer to multiple claimants and flatter the powerful. In the real Middle Ages, the potency of prophecy lay in its capacity to be reinterpreted over and over again as political conditions changed. Geoffrey’s History was published in the 1130s. Just 40 years later, a writer named Alanus (probably the French theologian Alain de Lille) complains that people are misinterpreting Geoffrey. Geoffrey’s prophecy of a savior king was eventually made to refer to every English king from Henry IV to Henry VIII.